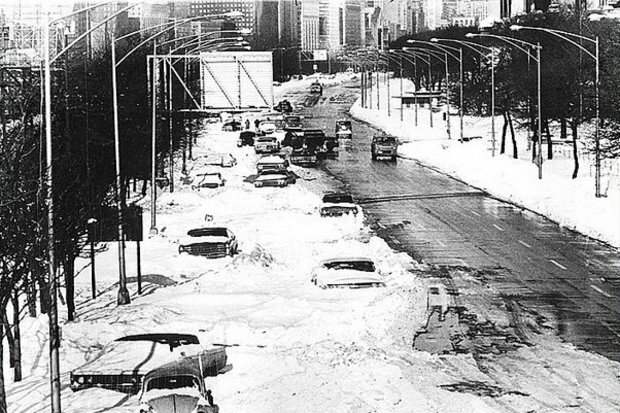 CHICAGO — Fifty years ago Thursday, a record snowstorm pounded Chicago, dropping 23 inches over a two-day span. The accumulation — over 35 straight hours from Jan. 26-27, 1967 — is still a record for the city. "Some of the snow from 1967, there was so much of it, they didn't know what to do with it," Peter Alter, of the Chicago History Museum, told DNAinfo in 2015. "They put it on train cars, and they shipped it to Florida for kids who had never seen snow." In 2015, the city came close to breaking the record when 19.3 inches fell from Feb. 1-2. That was the fifth largest snowfall on record. The runner-up award goes to the New Year's Day snowstorm of 1999, when 21.6 inches of snow blanketed the city. Only four inches of snow were predicted for what turned out to be Chicago's biggest snowstorm ever, according to the Tribune. The storm led to 50,000 abandoned cars and 800 CTA buses, and 26 people died, the Tribune reported. The Sun-Times noted that 53 mile-per-hour wind gusts were recorded at Midway Airport, which resulted in 6-foot-high snowdrifts. Check out some videos from the 1967 blizzard, including a newscast from Channel 5, below.